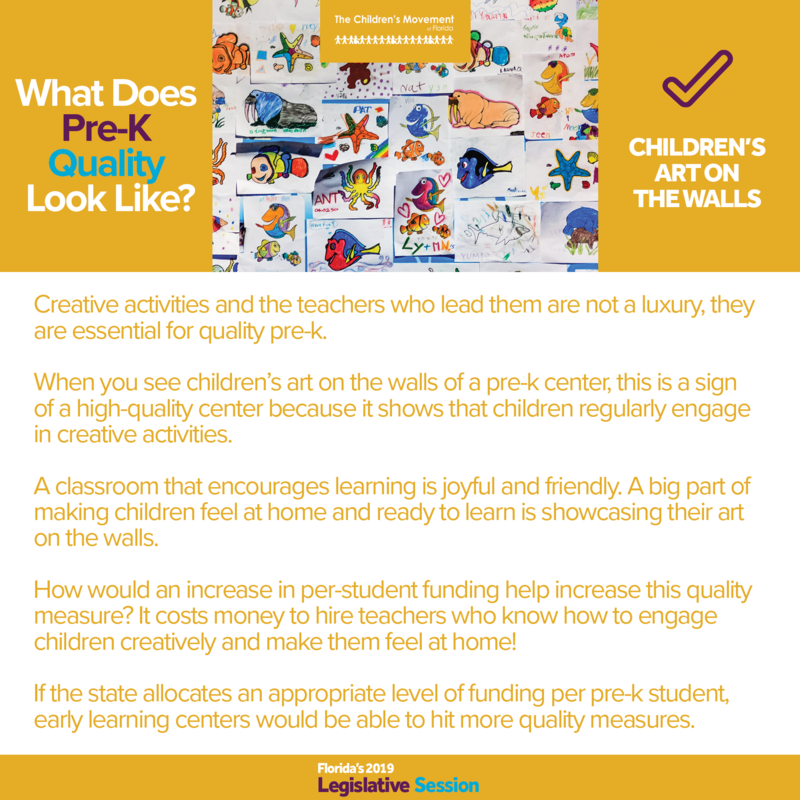 During legislative session we will update you on bills and appropriations related to early childhood and provide examples of what quality looks like in pre-K. Legislative updates are courtesy of the Florida Children's Council. Below is a selection of bills we are following. The first column lists the bill number and bill sponsor and provides a hyperlink to the bill text. The second column represents the number of committees of reference for each bill and provides bill history--see the color coding key below for details. The final column gives a brief description of the bill. These identical bills require vehicles used by child care facilities to transport children be equipped with reliable alarm system that prompts driver to inspect vehicle for children before exiting and requires DCF to adopt minimum safety standards & list of approved alarm systems. SB 970 - Sen. Baxley These identical bills require the principals of public elementary schools to facilitate communication and collaboration with private prekindergarten providers and requires the Office of Early Learning and Early Learning Coalitions to provide support for this collaboration. 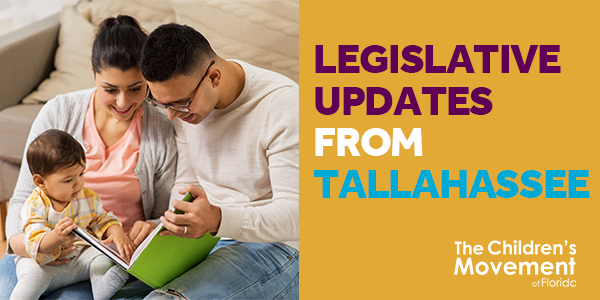 SB 1138 - Sen. Simmons Allows a parent to enroll child in a family engagement computer adaptive prekindergarten program, authorizes an early learning coalition to administer the VPK Program to these students and adds requirements for the implementation of the program. SB 1456 - Sen. Perry Requires the Office of Early Learning to establish both formal and informal pathways for early learning teachers in the school readiness program to ensure access to specialized professional development. SB 354 - Sen. Montford Revises provisions relating to the Immunization Registry by allowing a college or university student age 19-24 the right to refuse to be included in the immunization registry and requires health care practitioners to report vaccination data to the immunization registry for children birth to 18 unless a guardian refused to have the child included in the registry by meeting certain requirements. SB 572 - Sen. Baxley Requires a health insurance policy that provides coverage on an expense-incurred basis for a family member of the insured to provide coverage for children birth to 21 for hearing aids prescribed, fitted and dispensed by a licensed audiologist and establishes the minimum coverage amount of $3,500 per ear within a 24 month period. SB 7030 - Education Committee Builds upon the school safety and security foundation established in SB 7026 (2018) by addressing the school safety and security recommendations of the Marjory Stoneman Douglas High School Public Safety Commission, and strengthening accountability and compliance oversight authority. SB 1082 - Sen. Book These similar bills require the Florida Building Commission to incorporate specified requirements related to baby-changing tables into the Florida Building Code including requiring any building with a public restroom built after Oct. 1, 2019 to include a baby-changing table. SB 60 - Sen. Book Exempts the sale of diapers and incontinence undergarments from sales tax. These similar bills permit AHCA to pay for the cost of donor human breast milk for which a licensed physician or nurse practitioner has issued an order for an infant who is unable to receive maternal breast milk but requires breast milk nourishment. SB 348 - Sen. Montford These identical bills establish the Exceptional Student Education Taskforce within the Department of Education to develop and provide recommendations to the State Board of Education for the improvement of accommodations for standardized assessments of exceptional students. The State Board of Education must submit its recommendations based on the information from the task force to the Governor, Senate President and House Speaker by November 2019. SB 349 - Sen. Book These identical bills, related to students with disabilities. define associated terms, requirements for use of physical restraint, exclusionary and nonexclusionary time, training procedures, monitoring and reporting requirements of staff. These identical bills require each public school to create a School Staff Assistance for Emergencies (SAFE) Team and a plan for instances when a student with a disability walks away, runs away or otherwise leaves supervision or school grounds before the scheduled end of the day. The Children’s Movement of Florida is a 501(c)(3) nonprofit, nonpartisan movement of Floridians insisting on a strong start for all Florida children. The Children's Movement of Florida © 2019 All rights reserved.